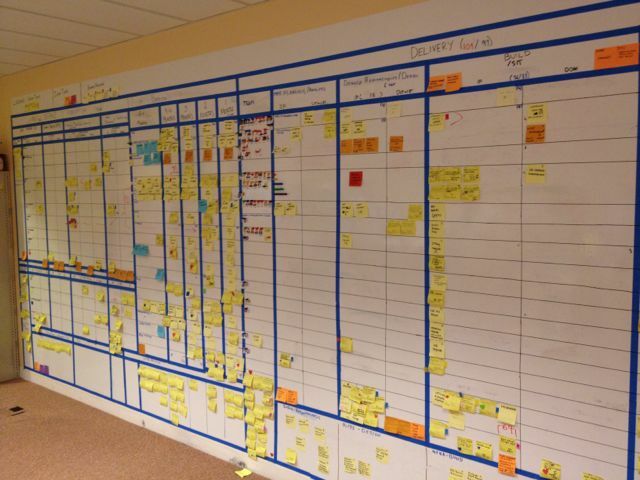 At the beginning of the transformation, we took over a photo copier room in order to create the world’s largest Kanban board! 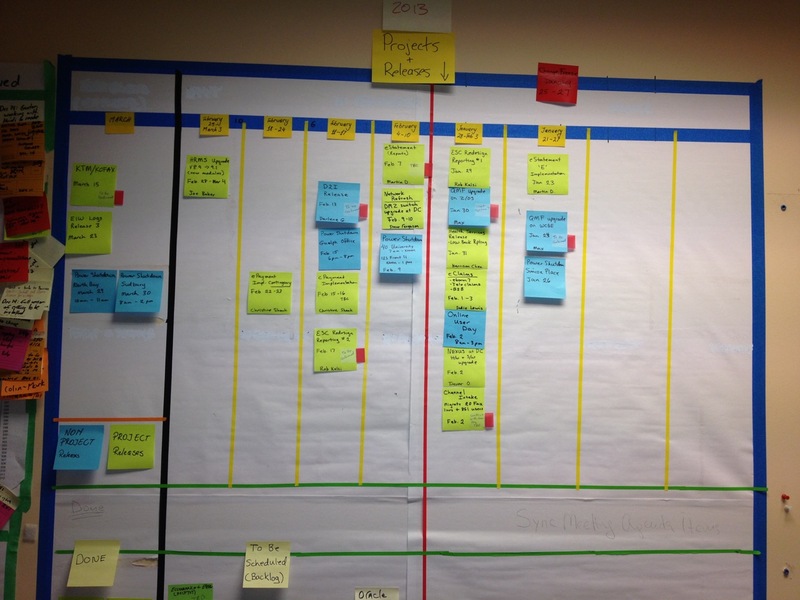 This Kanban board started its life as a typical Kanban board. It reflected the current process and had everything from intake through to delivery and operational work on it. 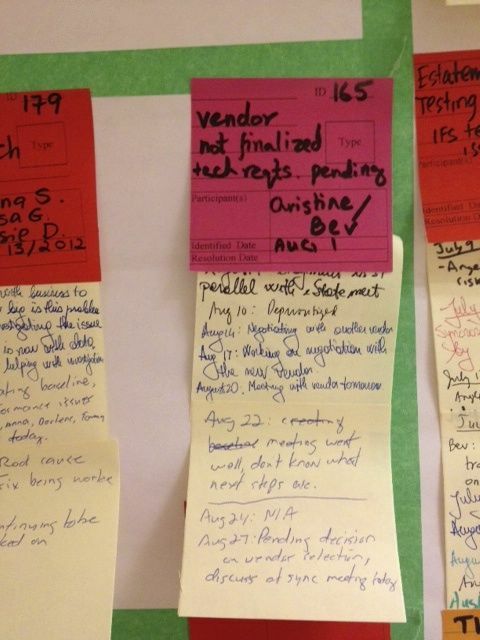 It included change management queues, data operations, infrastructure and more. We started by having stand-ups 3 times per week in front of this board and we’d review issues, risks and blockers. We attempted to capture current state and measure throughput by the way of MMF’s (minimal marketable features) but the board was far too complex and nobody (other than the change agents) actually used it. The left side of the wall had a Portfolio Board, Release Board, Issue/Risk/Blocker Board and QMO (the coaching team) board. Shows progress from Intake through to Delivery. A list of all releases happening in the organization. This was reviewed weekly and run by the IT change management team. Escalation policy was in place to involve executives if the issue wasn’t resolved within 2-weeks. We didn’t enforce this very much. The back wall was an open space working area. 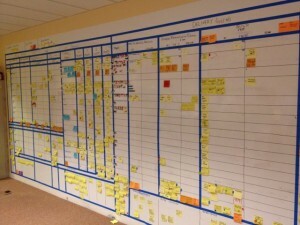 It’s difficult to see, but one of the boards on the back wall was the managers improvement canvas. 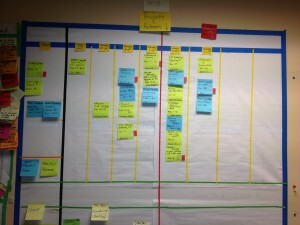 On the right side of the wall, we built a dependancy board as the main business transformational program had a number of dependancies with “foundational” projects. PM’s would inject work into another projects work stream when a dependancy came up. 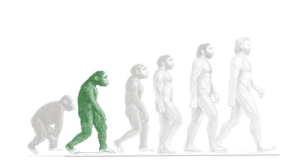 On the far right side was the system architecture diagram showing how all the applications and components fit together. The Enterprise Architecture team kept this updated and also held information sessions monthly to keep people aligned on the big picture.